In recent days, on many streets of Hanoi like Hang Luoc, Hang Ma, Cha Ca, etc. 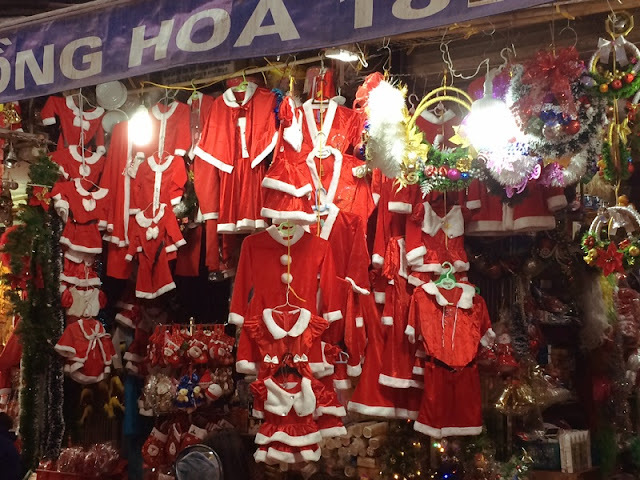 you will see every shops are colorful with red and green colors of pine tree, Santa Claus’s clothes with different sizes for kids and adult. Daily toys are given away to display Christmas items. In every day, Hang ma street is only bustle and hustle in rush time and night. But in days close to Christmas, the street is always full of peoples and attracts interest of foreign tourists. Hanoi pedestrian streets were also transformed into exciting spaces along with many attractive activities held on Christmas Eve. In this picture, young people participate in a traditional dance named nhay sap (bamboo dance). Strolling around main thoroughfares, pine trees decorated with mini lights and gifts have turned into prime attractions. Young folks take to the streets to capture memorable moments during the holiday season. Many of them even wear red-and-white Santa Claus outfits and moustaches to take selfie and group photos and earn extra income by delivering gifts to children right on the doorsteps. In major shopping malls like Trang Tien Plaza and Vincom, pine trees are beautifully lit outdoors, attracting visitors to take photos and soak in the festive mood. Jubilant atmosphere also comes to coffee shops through a medley of Christmas melodies.